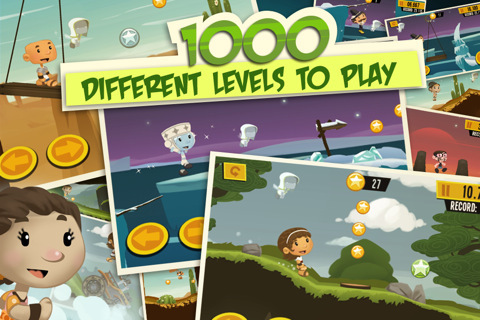 1000 Heroz [$0.99 / HD] is a simple game wrapped in a fantastic gimmick. Every day you can open it up to find a new hero and a new level to conquer. You’ll need to hurtle your hero to the finish line as fast as you can to top the leaderboards for the daily competition. I find little as compelling as fighting a few dozen of my nearest and dearest for the top spot in a game like this. The game inside the gimmick is a little less exciting. So far the levels have been short and sweet. Climb a few hills or stumble down them, leap over a few pits, dodge a few rocks and you’ll get your hero to the finish line. The biggest challenge is mastering the exceptionally floaty physics – if you need precise jumps to enjoy a platformer, you’ll definitely want to stay away. But I’m okay with the floatiness. I’d prefer something smoother, but it matches the rest of the game’s style perfectly and provides a decent challenge. The short levels might also be a problem if you’re looking for a game that really lets you dig in. There’s nothing deep about 1000 Heroz – at least not so far. Each level has three rankings – bronze, silver and gold. Both levels that are currently unlocked have gold completion times of under 20 seconds. It might take you a while to get there, but if you’re doing well it doesn’t take much longer to complete a level than it does to load the game and choose your level from the menu. I wouldn’t count that against the game, though. It’s great to sit down for hours playing some games, but if I’m going to play a game for 1000 days, I’m glad it’s not going to take up too much time. The real question is whether or not I’ll actually want to keep coming back for that long. I can’t say for sure, but right now I really want to see what each day has to offer. We’re currently in the Ancient Age of Hungry Lizards, and our heroes are cavepeople. Each 20 days, we’ll enter a new time period within that era, and after 80 days we’ll move on to the Hungry Age of Famished Farmers. I want to see those famished farmers. I want to get gold rankings in all their levels. And if you get at least a silver ranking on a level, you unlock its relic. I want to unlock them. I also want to top the leaderboards. The competition is already fierce. While the game uses Game Center to identify you, it isn’t used for achievements or leaderboards. There aren’t any achievements, although there probably should be-the game’s already great about tracking stats. Leaderboards are done in-house by RedLynx. This means you can’t compete against your Game Center friends, but it also means your rankings stay the same in both the standard and HD versions of the game. To make up for the lack of GC friends, you can join a Custom League in the options menu to compete against friends or online communities (our forum users are building a league as I write this). Currently you can only join one, but if a future update allows us to join multiple leagues I’ll be happier. If you’re a total completionist and you’re feeling like you’ve already missed out, don’t fret. You can go back and play previous days’ levels with their heroes, and you can earn their relics. You can’t compete on the leaderboards, though – the competition closes when the new day’s levels unlock. If you want to make a name for yourself in 1000 Heroz, you’ll have to be willing to put in your daily time.